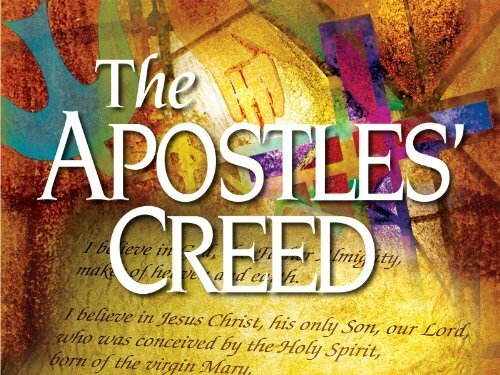 I am currently commenting on the articles of the Apostle’s Creed. This is for my benefit as much as anything. These remarks are organized only because they are following the outline of the creed. So while they are not systematic, I hope they are not rambling either! I’m giving myself a refresher course and you’re invited to come along. And as you do I trust these few words may contribute something to your understanding of what it is to have faith in the God of Jesus. Christ is risen.. This confession of Christ’s Resurrection is not one article of faith standing among many. The essence of the faith is proclaimed in the Resurrection. St. Paul stated this with an unsurpassed pointedness when he wrote, “If Christ was not raised, there is nothing in our message; there is nothing in our faith either…” (1 Corinthians 15). Indeed, if there was no resurrection then the crucifixion was a tragedy, nothing more. Death looms as large as ever and all this talk of Christ alive is so much whistling in the dark. In the last century or so biblical interpreters of the historical-critical method of studying Scripture have largely concluded that reason applied to the Bible can offer no proof of the bodily resurrection of Jesus. Instead, they have tended to rely upon what we might call psychological explanations. Some sort of spiritual Christ consciousness settled upon the disciples after Jesus died. Or, the early Christians projected their vision of hope onto Jesus. But these, it seems to me, are nothing more than tricks to satisfy the skepticism of our reason. For these ‘explanations’ also take us beyond the boundary of historical reason. The brutal suffering and death of Jesus left the disciples in despair. They were a broken, defeated remnant of a lost cause. What revived them? Did they simply “look on the bright side” and give themselves a pep talk and say things like’ ‘Let’s carry on for good ol’ Jesus’? On the contrary, their faith was not revived by anything they did. The most obvious explanation for their transformation is the one given by the New Testament witness; the one whom they saw crucified, dead and buried, they also alive and arisen from the grave. With the appearance of the Risen Lord the disciples were brought face to face with the fact that while Jesus lived, they were the ones who had succumbed to death. Their despair, faithlessness and refusal to believe what he had told them of His death and resurrection simply confirmed their deadness. If Jesus was the dead One who was now living, the disciples were the living dead. So faith hears the message proclaimed of Christ Crucified and Risen. We stand before this proclamation and in this liberating Word we, too are brought from death to life. In the word of the Gospel and the sacraments, the Living Lord confides Himself to us, and in the words of the New Testament, …”causes us to be be born anew to a life of hope through faith in the power of God” (1 Peter 1).